Whether you're landing at or flying out of New York City's John F Kennedy Airport, chances are you'll need to know where you're going before you head out. Fortunately, there are a number of ways to and from JFK airport, each with its own advantages and disadvantages. JFK Airport covers a huge territory of approximately 4,930 acres with 30 miles of road, so finding an address for the airport can be a bit tricky—it all depends on what you need to do at JFK. However, if you simply enter "JFK Airport, Van Wyck and JFK Expressway, Jamaica, NY 11430," into Google Maps, you should arrive at the heart of the Central Terminal Area and be able to easily transfer to other carriers from there. Because of JFK's large, expansive size, you'll want to know what airline or service you need before you leave home. If you're curious about terminals, here's a map of JFK's central terminals provided by the Port Authority. Headed to JFK and need directions and a map? The best address to use for maps, car navigators, and GPS devices is Van Wyck and JFK Expressway, Jamaica, NY 11430, which lands you at the Central Terminal. However, if you already know the specific airline you're using, you can also go directly to its affiliated terminal by checking the Port Authority of New York and New Jersey website. JFK Airport has six main terminals: Terminal 1, Terminal 2, Terminal 4, Terminal 5, Terminal 7, and Terminal 8, offering flights on over 80 different airlines. If you know which terminal you'll be using, you can simply type in the terminal name before "JFK Airport" on GPS and it will guide you directly to the terminal's location. For most international travel, you'll be using John F. Kennedy Airport's international terminal at Terminal 4, which is the site of the customs department for the Port Authority of New York, though you should check with individual airlines on the day of flight to make sure your plane didn't change terminals because of unexpected delays or circumstances. If, however, you need to mail something to JFK Airport Operations, the best address to use is John F. Kennedy International Airport, The Port Authority of New York and New Jersey, Building 14, Jamaica, NY 11430. For those flying to and from New York City, there are a number of great options for getting to and from John F. Kennedy International airport including driving, public transit, and even a direct helicopter ride from Manhattan. When driving to JFK, you'll eventually end up on first the Van Wyck Expressway then the JFK Expressway, which passes by all six of the airport's terminals. From downtown Brooklyn, driving can take anywhere from 35 minutes to a little over an hour, and from Manhattan, you can expect your commute to take at least an hour. Public Transportation to JFK is also available and includes the MTA subway system via the A or 3 trains or select bus services. 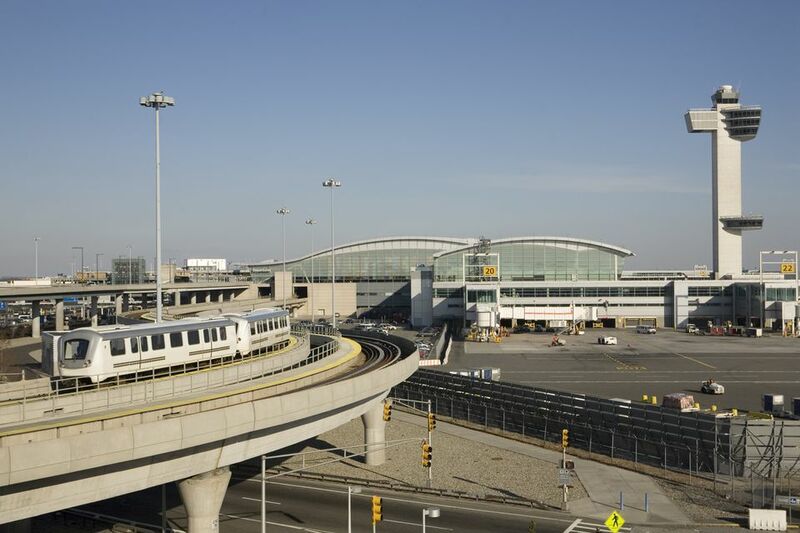 There is also a public AirTrain which connects travelers from JFK's terminals to the subway system as well as allowing transfers between each terminal. With public transit, always plan an additional 30 minutes for your trip to account for unexpected delays.